The Phoenix Type III Barricade from TrafFix Devices is lightweight making it easy for a single worker to setup or breakdown. It comes complete with (2) 72″ plastic pre-drilled uprights which attach to (2) 40 lb. recycled rubber and steel bases. The recycled rubber and steel bases nest together for easy storage and transport and each have a quick release pin for easy removal of the barricade uprights. The Phoenix Type III Barricade is compatible with the Plastic Phoenix Rail panels and can be custom sheeted. 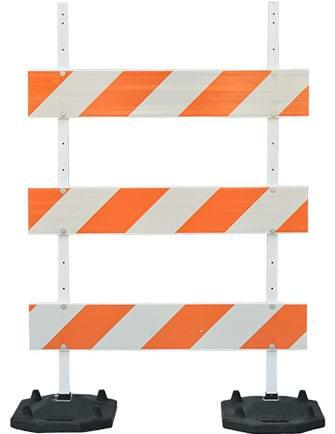 The Phoenix Type III Barricade is NCHRP 350 approved.